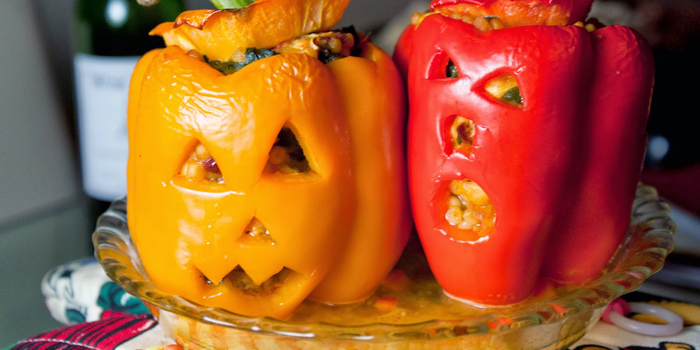 Since pumpkins are synonymous with Halloween I thought we should carry that theme even further into the kitchen with these adorable, delicious, stuffed and decorated peppers. The couscous choice was merely one made based on our upcoming move (the more pantry items we eat, the less we have to pack and move). Substitute in rice, quinoa or other grain of your choice. The slightly wilted pepper mixes with the pumpkin, the chorizo, the creamy goat cheese and the tart, dried cranberries for a glorious spooky bite. I’ve roasted a lot of pumpkins but only recently heard that you don’t have to scoop out insides before roasting, but rather leave the insides intact and scoop out after roasting. This made me curious so I did a little experiment by roasting half of the pumpkin cleaned out and half not cleaned out. The results were pretty much the the same: a dreamy, creamy roasted pumpkin; though I found I preferred cleaning out the pumpkin first, maybe just for nostalgia sake. Over medium heat, crumble the sausage. Cook until nearly done. Add in the Swiss chard leaves and continue to cook until the leaves are wilted and the sausage cooked. Remove from pan and set aside. Add in the olive oil, the shallots, turmeric, red pepper flakes and the Swiss chard stems. Cook a few minutes to soften. Add in the water and pumpkin, and bring to a boil. Add the couscous, cover and reduce the heat to low. Simmer for just under 10 minutes, just to keep the couscous el dente. Add in the sausage and Swiss chard mixture, the cranberries and the goat cheese. While the couscous is cooking, clean and cut the peppers. Cut a hole around the stem (as you would a pumpkin), taking out the inside seeds and veins. Cut a face in the pepper and throw the pepper cut-outs in the couscous mixture. Squeeze the orange into the bottom of a shallow dish. 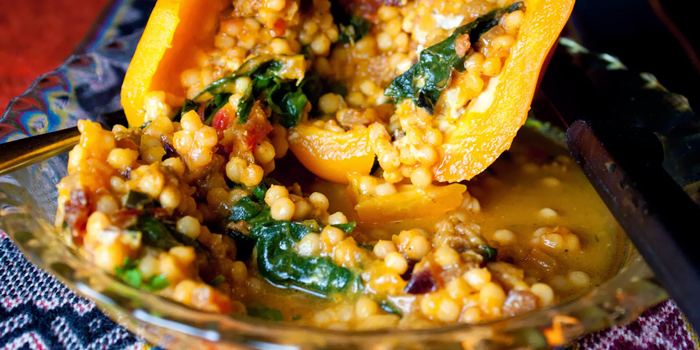 Fill each pepper with the couscous mixture, top with the pepper stem and set into the dish with orange juice. Place in a 400 degree oven for about 30 minutes. Drizzle the juice over the peppers, add a handful of chopped parsley or cilantro. Enjoy. Fat and Happy Food Blog Tips and Techniques: Choose smaller pie pumpkins over larger carving pumpkins for roasting purposes. 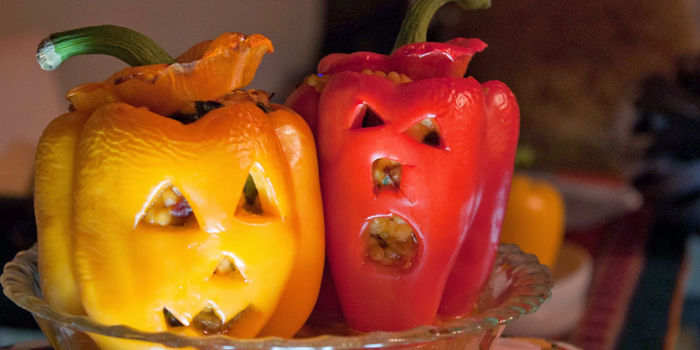 Try making this with mini peppers for an appetizer.